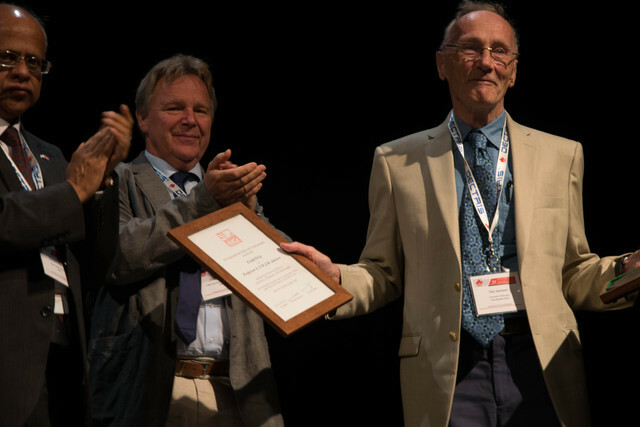 Professor Ted Janssen receives the certificate and medal of the Ewald Prize from IUCr President Gautam Desiraju and Vice-President Claude Lecomte. Professor Aloysio Janner was unable to attend the ceremony at the Montreal Congress. The tenth Ewald Prize has been awarded to Professors A. Janner and T.W.J.M. Janssen (both from the Institute for Theoretical Physics, University of Nijmegen, The Netherlands) for the development of superspace crystallography and its application to the analysis of aperiodic crystals. The presentation of the Ewald Prize will be made during the Montreal Congress Opening Ceremony on 5 August 2014. For a list of papers by Professor Janner appearing in IUCr journals click here. For a list of papers by Professor Janssen appearing in IUCr journals click here.